Growth is becoming increasingly difficult. Marketers across the globe are scouting for innovative methods and tactics to attract users. 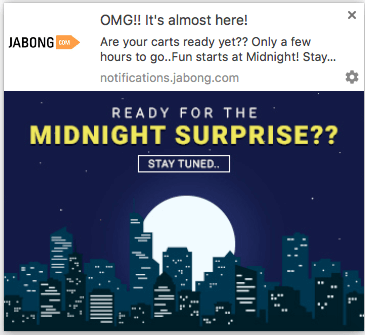 Marketing using web push notifications is slowly hitting the mainstream, especially in e-commerce. This article talks about how marketers in the retail are using this channel to drive business. These are the best of times and these are the worst of times. As of May 2017, 96% of Americans shop online. To top that up, eCommerce businesses generate over $1.2 billion every 30 seconds. Do the math! United Nations Conference on Trade and Development has claimed that by 2018, global online shoppers will grow by 50%. Now that we know what's in store for you, let's also have a peek at the harsh truth. There are more than 1.7 Million eCommerce websites on the web today vying for attention. Woah! Yes, you are just like one of the stars in this never ending universe. This is where the challenge actually starts. 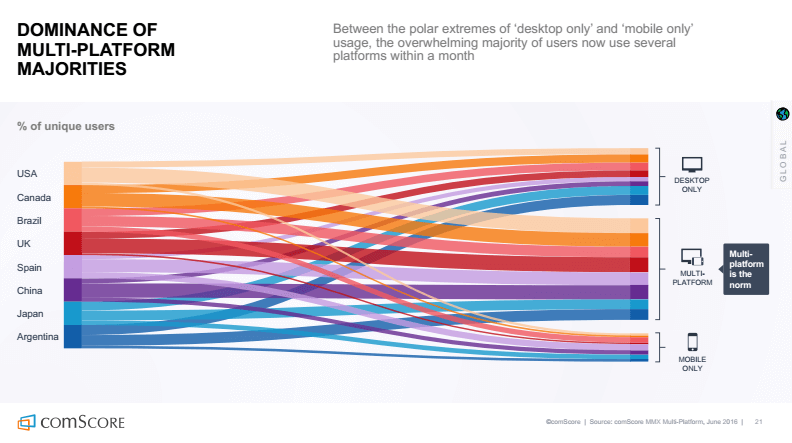 Why should users choose you when they have a plethora of options ahead of them? It has become a challenge to engage the users, re-engage them back to your website and re-target them to encourage transactions. According to Baymard Institute, an average cart abandonment rate is 69.23%, which results in around $4 trillion loss of sales annually. When shopping online, 48% of online purchasers first turn to an eCommerce store that offers various products. 31% first shop at a large online/offline brand name retailer, 12% first shop at a category specific online retailer, 7% first turn to a small/specialty online retail brand (more on conversion rates here). Marketers need communication channels and platforms that have the ability to reach users across devices. More than 62% of users have made an online purchase via their mobile phones in the last 6 months which effectively means that eCommerce websites can’t think of ignoring it anymore. It has been observed that each platform enjoys peak hours in a single day as well. This makes it even the more important to be available on all major devices. You lose out on one device, and you miss the opportunity to engage with the users, which ultimately lead to sales. 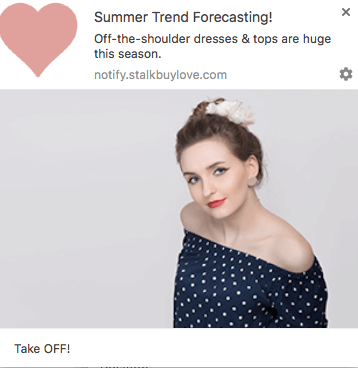 E-commerce websites are constantly exploring multiple re-targeting tools that can help them bring back repeat traffic and boost their conversion metrics. While there are multiple tools that you can use, not all of them provide a substantial value. You can check out the advantages and disadvantages of few marketing channels here to get better clarity. Marketing using web push notifications has a clear advantage over other channels - both in terms of performance and brand recall. E-commerce websites need a tool that not only uplifts the conversion rate but also offers contextual-based communication. This is one of the reasons contributing towards the popularity of web push notifications for eCommerce marketing as a re-targeting tool. 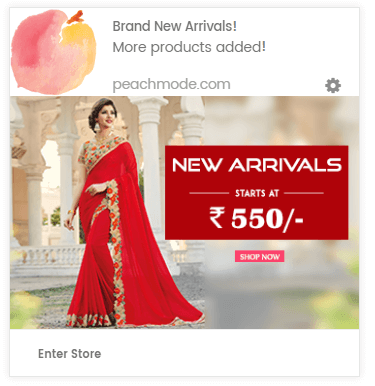 Web push notification for e-commerce marketing extends its support to varied CMS platforms including - WordPress. Shopify, Joomla, WooCommerce, BigCommerce Zapier and much more. Check out all the web push integration guides here. Web push notifications are succinct updates sent to the users even when they are not on your website. Due to its crisp approach, there is no beating around the bush and information is shared in a jiffy. It helps to leverage geographical targeting and communicate in a timely fashion keeping time zones in mind. 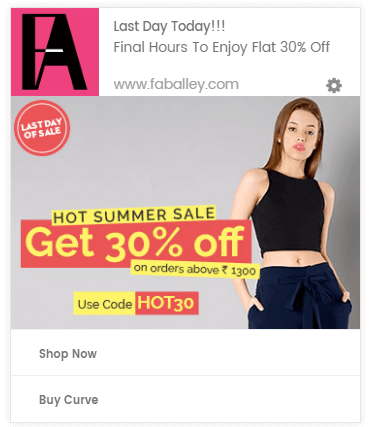 Why use push notification for e-commerce marketing? How do they help? Impact: Unlike email, web push notifications enjoy higher CTR's, hence better performance. 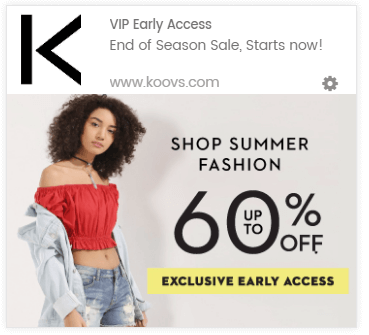 Agnostic to AdBlockers: Unlike display ads which are now rendered ineffective because of adblockers, push notifications are delivered to a user's notification tray. Better viewability and hence better impact. Get started with Push Notifications on your e-commerce website with iZooto. Book A Demo to learn more about how you can use push notifications to drive more sales. With web push, it becomes easy to send and schedule relevant notifications by segmenting users based on their behavior, interest, and activities they perform. They are swift and drive repeat visits, encouraging people to make a purchase. By implementing ‘User Properties’ and ‘Events’, users can be intelligently segmented and re-targeted back to your website. With emoji support, now you can make your notifications look lively and attract your users instantly. Check out some more features of browser push notifications to know what else it is capable of. Browser Push Notifications are clickable bite-size updates that work seamlessly across Desktop (all OS) and Mobile (Android only). Website Push notifications are supported on Chrome 42 and later, Firefox 44 and later and Safari 7.1 and later. Receiving a notification that seems tailor-made for the user, sparks interest and increases the chances of them landing on your website. The whole idea is giving them what they want. This becomes extremely easy after opting for User Properties and Events. Specific users can be targeted according to behavior and actions; to trigger a better response. 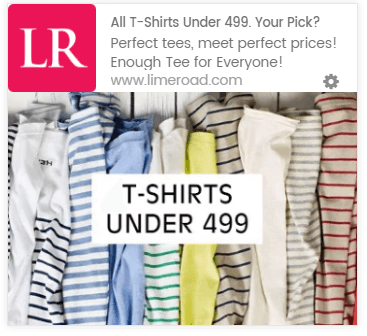 For example, Limeroad sent the above notification only to Men, who showed an interest in purchasing T-shirts. Blindly shooting out mass notifications might result in users unsubscribing from your website. 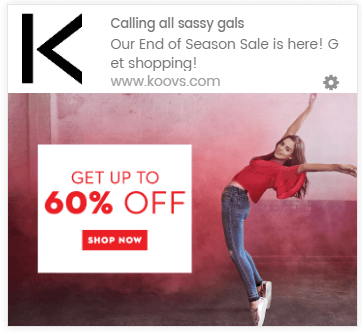 For example, Koovs sends notifications exclusively targeting women to reach out to the right crowd. Users who show an interest in a particular category can be sent notifications catering to their interest. 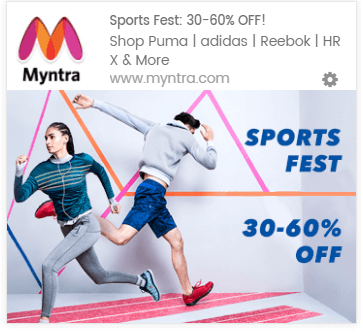 For example, if some users keep visiting the sports category of your website, it is a huge opportunity for you to encourage these users to make a purchase, by providing them with offers related to it. Welcoming a new season is one thing no e-commerce business would want to miss. Inspire users with your web push messages to indulge in all the new season collection. You can encourage users to change their wardrobe this season, get a makeover, or impress them with your new dashing collection. Festivals are a time when users splurge on shopping for relatives, friends and themselves. An amazing opportunity to convert your users with interesting offers and discounts. 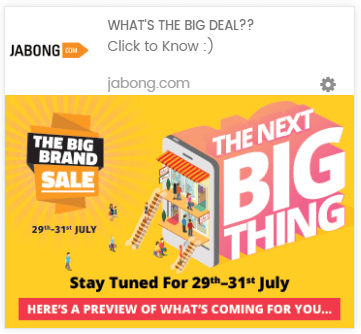 You can also send out occasion based notifications like company anniversaries, end of season sale by lacing it with offers they can resist. 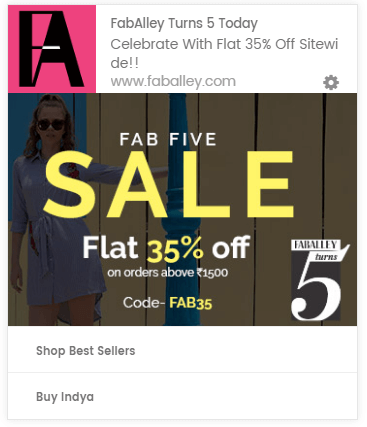 When you add a new collection, make sure you design your push notification campaign to do a great shout-out for all your users. 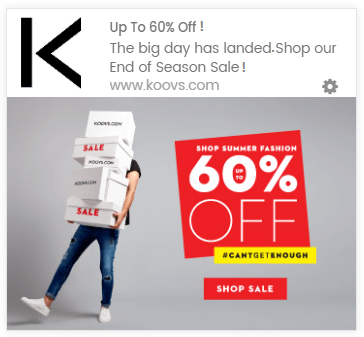 Just like what Koovs did when they added fresh arrivals to encourage users to try something new. This builds curiosity, and the ‘Fear Of Missing Out’ syndrome will drive users to your website. One of the best ways to create a sense of excitement and urgency is to try flash sales. 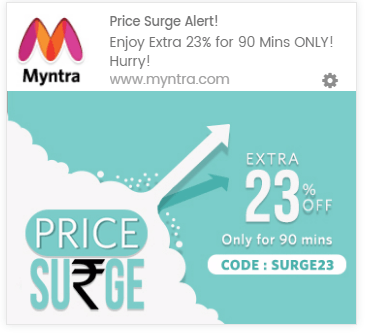 Myntra sends notifications with offers that are time bound. They also show what they will be missing out on if they do not make a transaction within the given hours. This prompts users to make an immediate purchase. These kinds of notifications will help you drive high traction to your website. Inform the users about the sale you are going to conduct along with all the specifications so that they look forward to it. You can also encourage them to visit your website to take a sneak peek of what’s in store for them. It helps to build curiosity and excitement, encouraging users to visit your site during the sale. Users in their busy life might forget all about the sale you are conducting. You need to remind them and encourage them to visit your site once the sale starts. 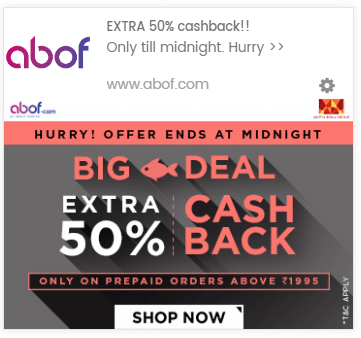 Some websites remind users before the sale starts, while the sale is going on and also send out a notification once the sale ends. ‘Currently Unavailable’ - this message on your user’s favorite product often becomes a reason to bounce from your website. To deal with this situation, many e-commerce marketers send out a push notification. This helps to update users, as soon as the product is available again. 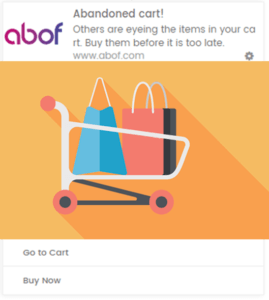 Some users forget that they have added an item to their cart and have not transacted. Users can be given a heads up that there are only a few pieces left. These kinds of notifications usually trigger a positive response and convert users. You need to pamper your loyal users so that their loyalty stays intact. Do that by giving them a special offer, an early access to a sale etc. This also encourages them to make a purchase and helps you build a stronger bond. Want to give web push notification a spin? You can now push notifications for free!